© 2002, © 2018 by Paul Freeman. Revised 7/25/18. Dayton Airport, as depicted on the 1967 USGS topo map. 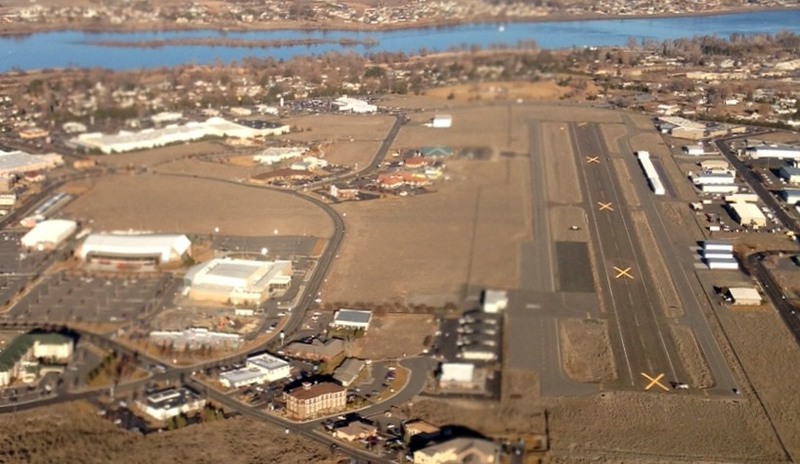 Yet another of America's thousands of vanished small grassroots airports. as it was not yet depicted on the 1958 USGS topo map. 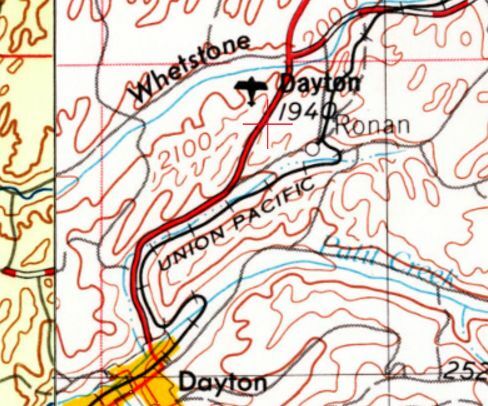 The earliest depiction which has been located of Dayton Airport was on the 1967 USGS topo map. It depicted a single paved northeast/southwest runway, labeled simply as “Landing Strip”. Dayton Airport was not listed in the 1971 WA Pilot's Guide (courtesy of Scott Kimball). Dayton Airport, as depicted on the 1974 USGS topo map. 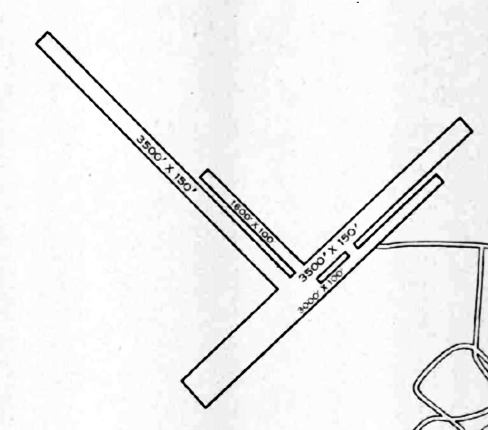 The 1981 USGS topo map depicted Dayton Airport as having a single northeast/southwest runway. The earliest photo which has been located of Dayton Airport (and the only photo showing aircraft at the airport) was a 1996 USGS aerial view looking northwest. with 3 light single-engine aircraft parked near a small building on the east side. as a 2003 aerial view showed the runway was much less distinct, and no aircraft were visible. with the land having been returned to cultivation. but no trace remained of the former runway. 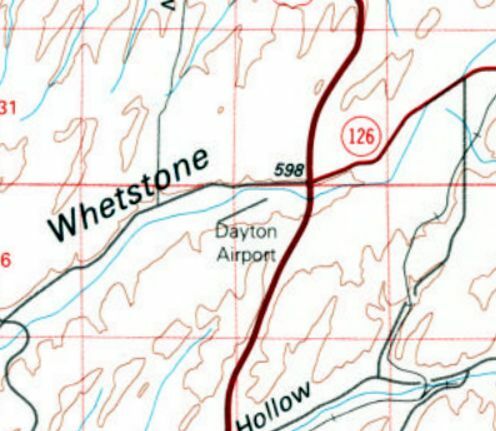 The site of Dayton Airport is located southwest of the intersection of Route 12 & Whetstone Road. Thanks to Lee Corbin for pointing out this airfield. 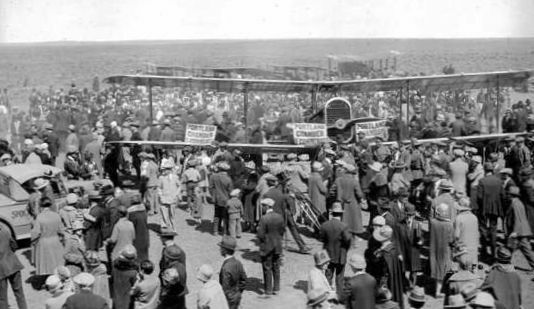 A crowd surrounds several biplanes at the 4/6/26 inauguration of the original Pasco Airport (courtesy of Jeff Adams). and Walter Varney was sole bidder for the Pacific Northwest feeder route (C.A.M. 5). 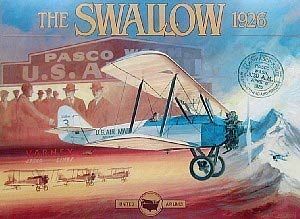 In 1926 the City of Pasco purchased 160 acres of land located approximately 1 mile southeast of the present Tri-Cities Airport facility (east of Oregon Avenue & south of the Cemetery). The county commissioners provided funds for the county roads crew to build a runway & hangar on this property in 1926.
at the inauguration of the original Pasco Airport (courtesy of Jeff Adams). 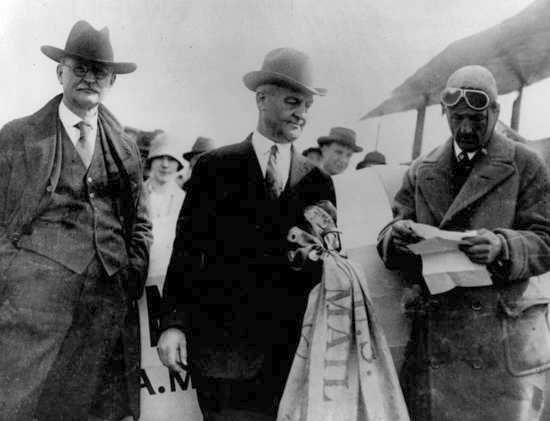 Three unidentified men at the 4/6/26 inauguration of the original Pasco Airport (courtesy of Jeff Adams). 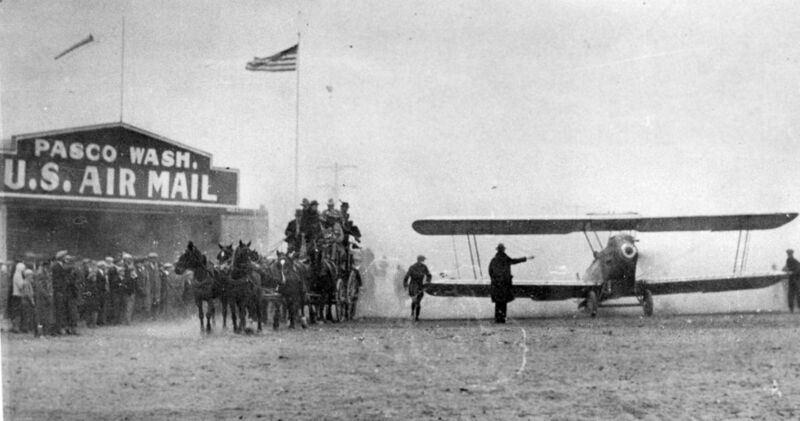 A 1926 photo of mail being transferred from a horse-drawn stagecoach to a biplane at the original Pasco Airport (courtesy of Jeff Adams). 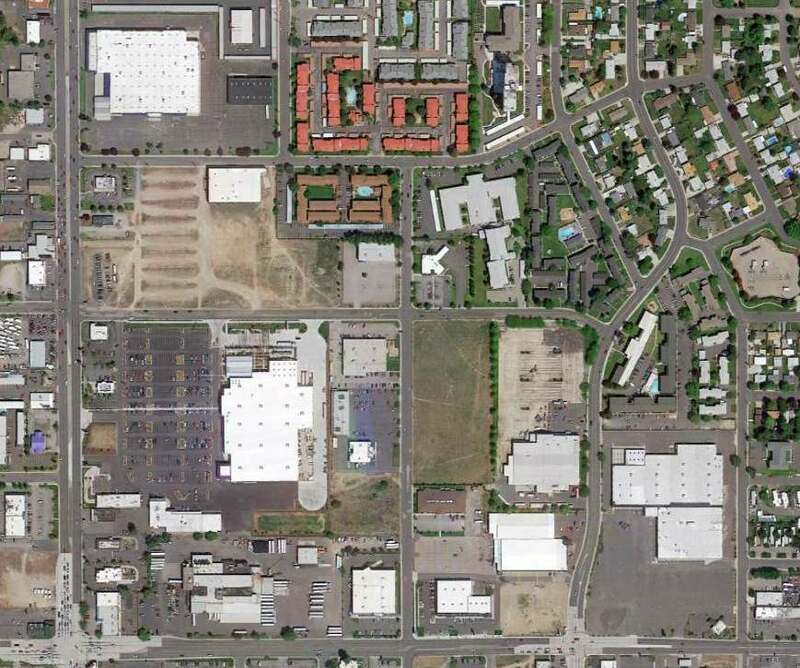 as a square outline having 2 runways with a hangar at the southwest corner. 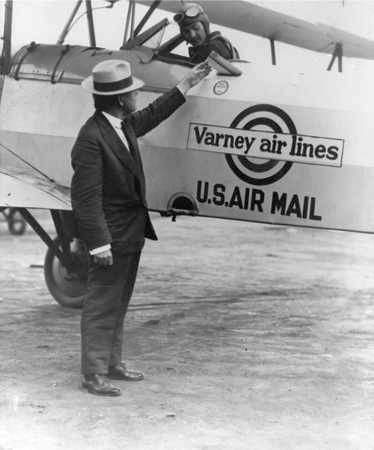 A circa 1920s photo of a man inserting an envelope in a slot of the fuselage of a Varney Air Lines biplane (courtesy of Jeff Adams). 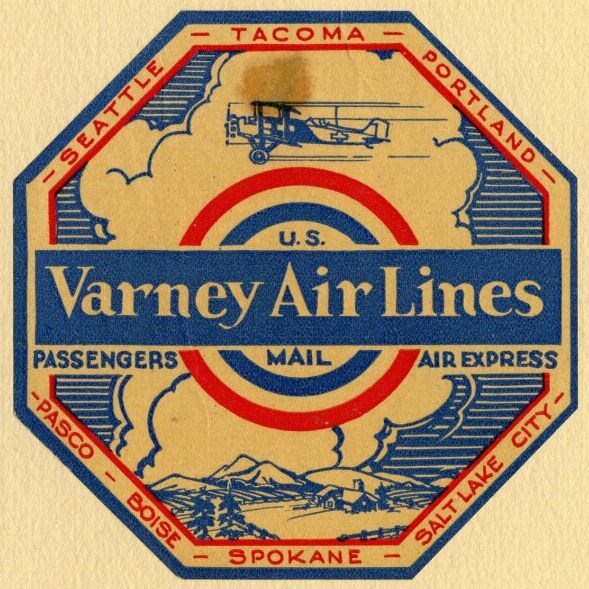 A circa 1920s logo of Varney Air Lines. 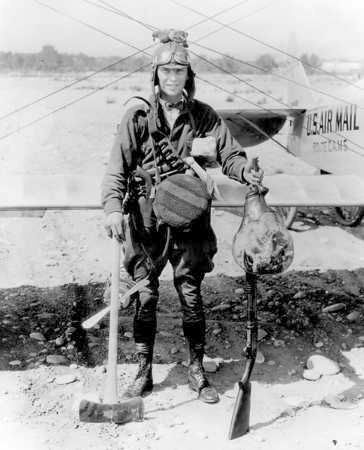 A circa 1926 photo of a Varney Air Lines pilot (courtesy of Jeff Adams). A 1926 illustration of a Varney Air Lines Swallow biplane (courtesy of Jeff Adams). 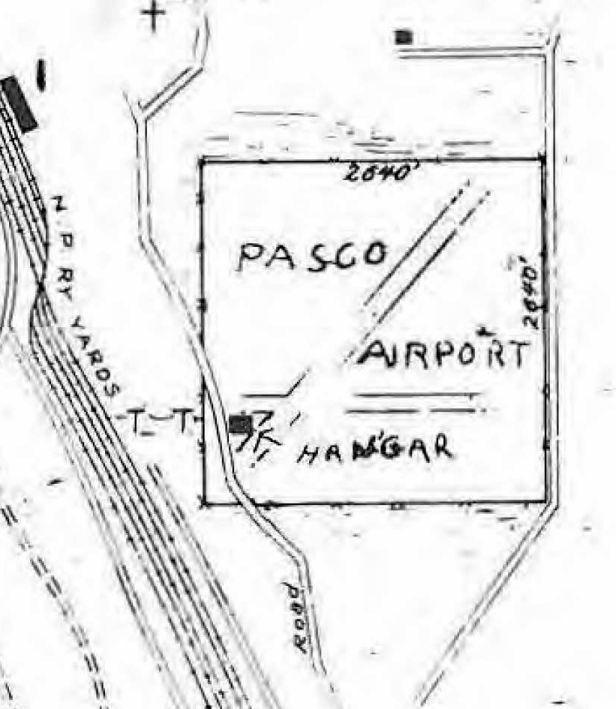 In 1929, the original Pasco Airport's hangar was relocated to the new Franklin County Airport 1 mile northwest, and the original Pasco Airport was evidently abandoned. 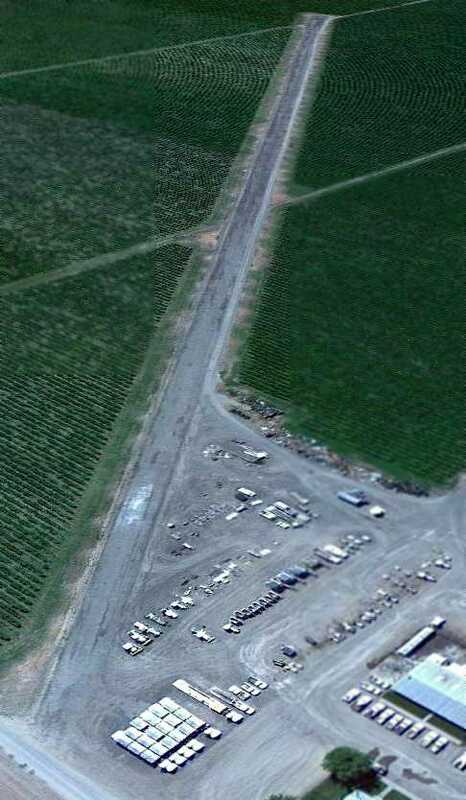 A 2013 aerial view showed no trace remaining at the presumed site of the original Pasco Airport. Thanks to Jeff Adams for pointing out this airfield. A circa 1947-48 photo by N.V. Starkebaum of an Aeronca & several other taildraggers at Richland C.A.P. Airport. nor depicted on the April 1945 Spokane Sectional Chart (courtesy of Ron Plante). showing a number of small general aviation aircraft & a few small hangars. A circa 1947-48 photo N.V. Starkebaum of a Navion in front of a hangar at Richland C.A.P. Airport. A circa 1947-48 photo N.V. Starkebaum of an unidentified glider at Richland C.A.P. Airport. A circa 1947-48 photo N.V. Starkebaum of “Stinky”, an an ex-RCAF Fairchild PT-26 (identified by John Boyle) which had come to grief at Richland C.A.P. Airport. The last photo which has been located showing aircraft at the Richland C.A.P. 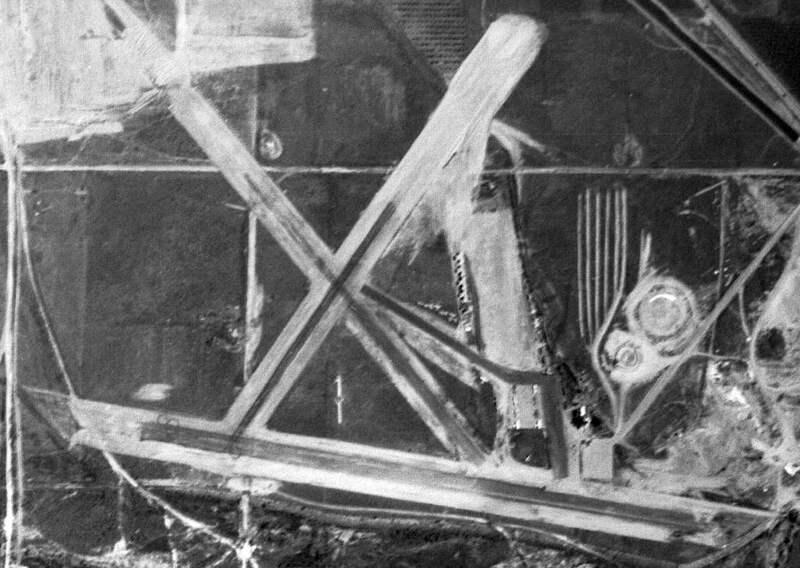 Airport was a 6/2/48 USGS aerial view. It depicted Richland C.A.P. Airport as having 3 asphalt runways, with a large number of individual T-hangars & 10 light aircraft on the east side. A June 1948 aerial view N.V. Starkebaum looking west at Richland C.A.P. Airport during the Flood of 1948.
and as they passed Lewiston they could hear on the radio reports of the flood. A 1950 aerial view by N.V. Starkebaum looking north at Richland C.A.P. Airport. my dad had a 1946 Stinson Stationwagon & I remember the fun of going for airplane rides with him. 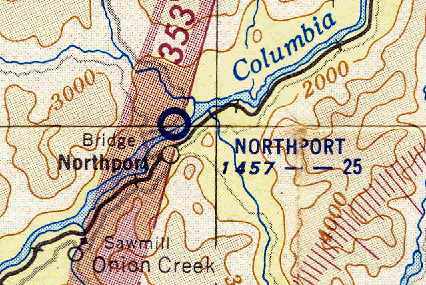 The 1951 USGS topo map depicted Richland C.A.P. Airport as having 3 runways & one small building on the east side. Jim Hard recalled,”In 1952, I learned to fly in an L-3B that became available after WWII. The airport I trained at was called the C.A.P. Airport, located on the south side of Richland. 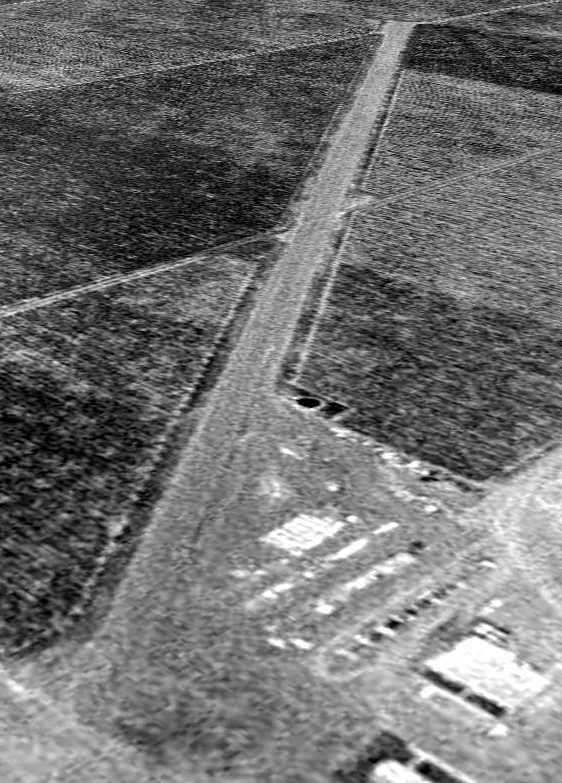 A 11/2/64 USGS aerial photo depicted the Richland C.A.P. Airport as abandoned, with the runways still intact, but gravel pits in the former ramp area. 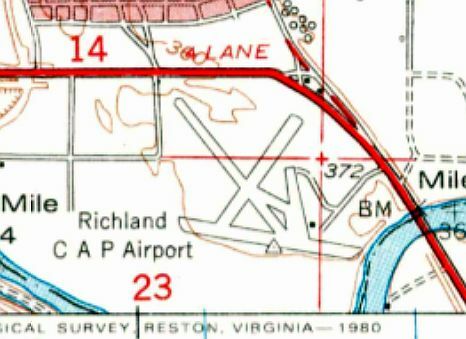 The 1967 USGS topo map continued to depict Richland C.A.P. Airport in the same fashion as the 1951 map. 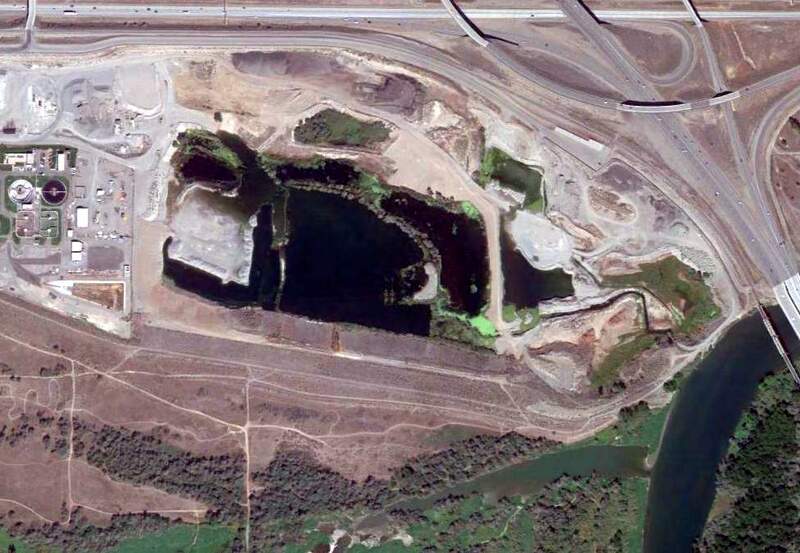 A 5/1/73 USGS aerial photo depicted some portions of the runways, but the site was being taken over by gravel pits. The 1978 USGS topo map no longer depicted the runways, and instead labeled the location as a gravel pit. A 1996 USGS aerial photo no longer depicted any trace of Richland C.A.P. Airport. A 9/6/12 aerial view showed no trace remaining of Richland C.A.P. Airport. Thanks to Jim Hard for pointing out this airfield. 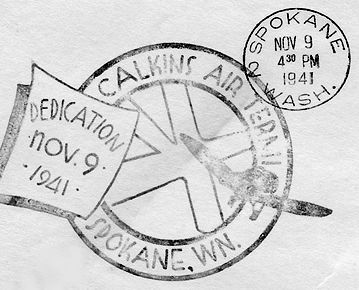 An 11/9/41 postmark commemorating the dedication of Calkins Air Terminal (courtesy of John Townsley). According to John Townsley, “Up until that point Felts Field was Spokane’s primary airport. It had long combined commercial, military, and private aircraft. regarding the possibility of the military taking a lease that would give it 'complete control' over Felts Field. Any such operational modifications could leave the civilian lease holders & their businesses out in the cold. 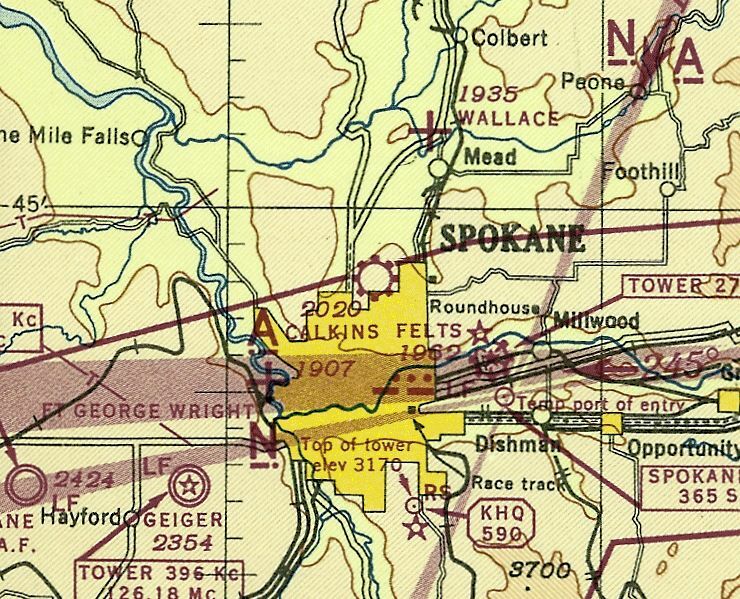 Due to the concurrent development of the totally military Sunset Field (later renamed Geiger) to the west of Spokane, the army never exercised said military necessity. According to John Townsley, “Claude Calkins had started toward his vision by quietly buying individual parcels totally 800 acres north of Spokane. This block of properties ran 1.5 miles north & one mile east from the corner of Division Street & Francis Avenue. During the winter of 1940-41 trees were removed & the necessary grading done. 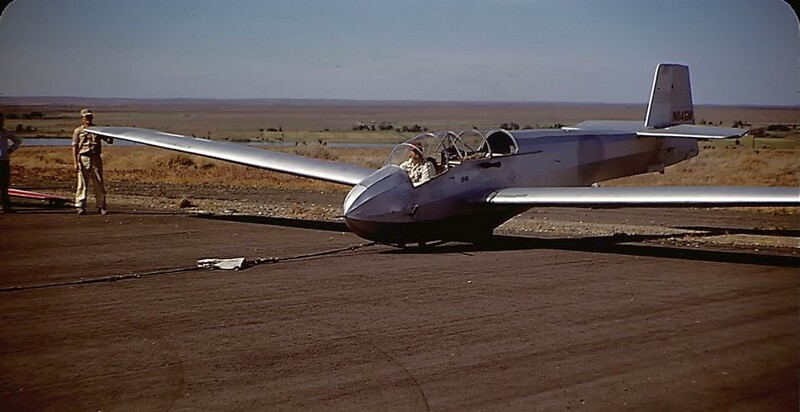 The first mile-long northeast/southwest landing strip - oriented to 'the direction of prevailing winds' - was completed at the beginning of May. An 11/9/41 postmark (courtesy of John Townsley) commemorated the dedication of Calkins Air Terminal. Tuffy & Orland’s eventual dealings with Calkins Field were in all probability associated with those programs. 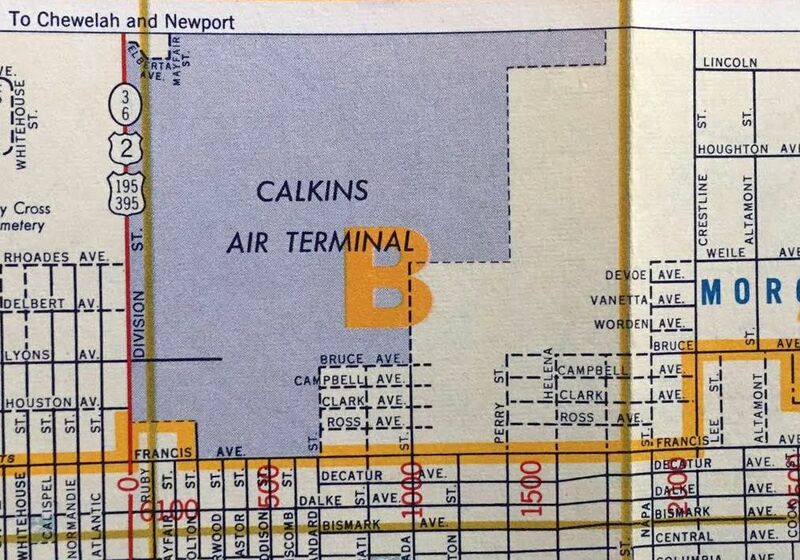 The only photo which has been located of Calkins Air Terminal was a circa 1943-45 aerial view looking north from the 1945 AAF Airfield Directory (courtesy of Scott Murdock). 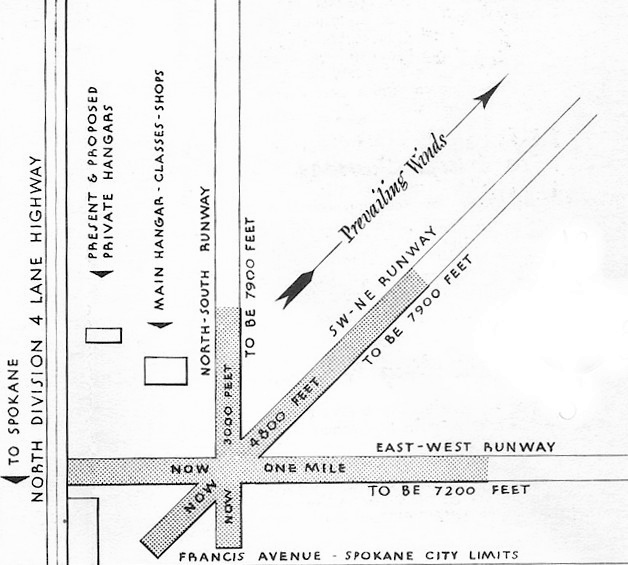 The earliest aeronautical chart depiction which has been located of Calkins Air Terminal was on the November 1944 Spokane Sectional Chart (courtesy of Ron Plante). It depicted Calkins as a commercial/municipal airport. having 2 sod & earth runways, the longest being the 5,280' east/west strip. 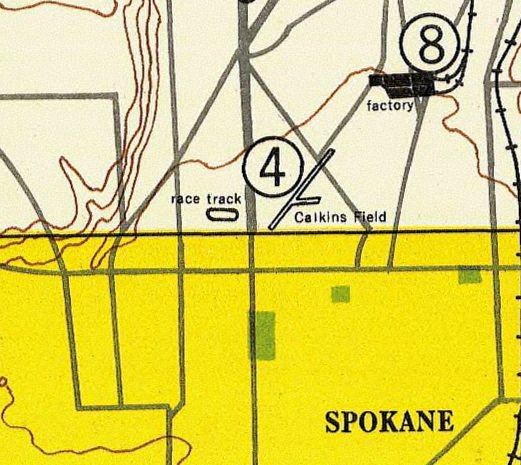 The 1948 USAF Spokane Urban Area Chart (courtesy of John Townsley) depicted Calkins Field as having 2 runways. as the 1950 USGS topo map depicted it as having 3 paved runways, with a complex of buildings to the northwest of the runway intersection. A circa 1950s brochure (courtesy of John Townsley) depicted future plans for runway lengthening at Calkins Air Terminal. 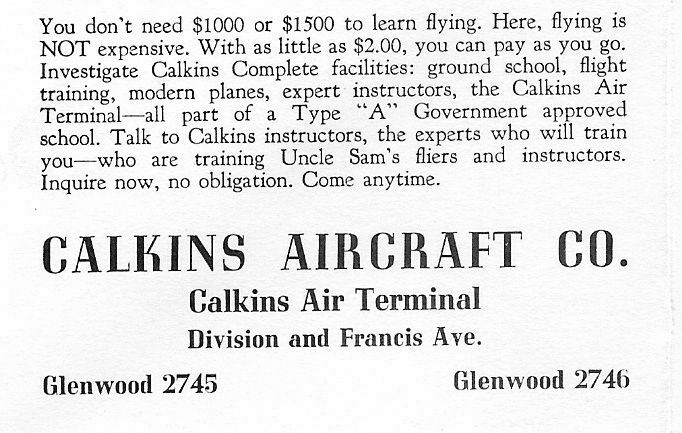 A circa 1950s brochure (courtesy of John Townsley) touted Calkins Aircraft Company. 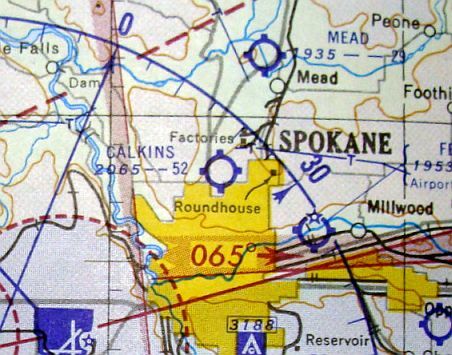 The last aeronautical chart depiction which has been located of Calkins Air Terminal was on the 1953 Spokane Sectional Chart. It depicted Calkins as having a 5,200' unpaved runway. which depicted it in an identical fashion to its depiction on the 1950 USGS topo map. which depicted Calkins as an irregularly-shaped property outline. According to John Townsley, “The airport seemed to be doing quite well until the latter half of the 1950s. which instead depicted several streets having been built through the site of the little airport. 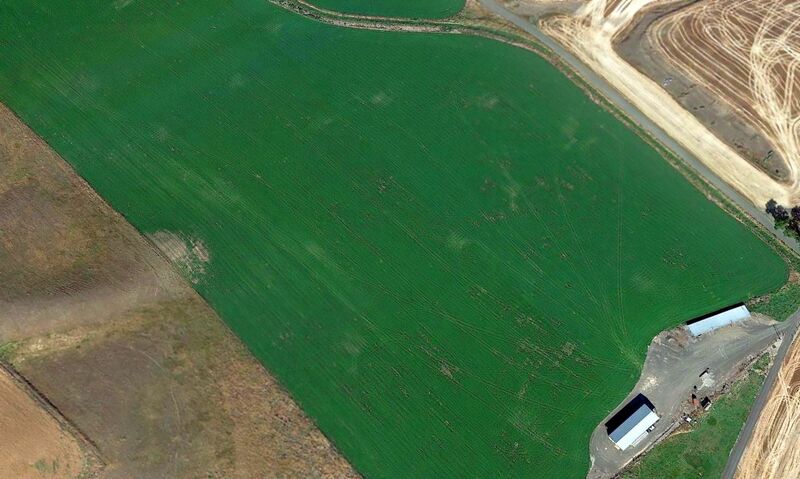 A 7/2/13 aerial showed no trace of Calkins Air Terminal. Thanks to John Townsley for pointing out this airfield. Vista Field, as depicted on the November 1944 Spokane Sectional Chart (courtesy of Ron Plante). 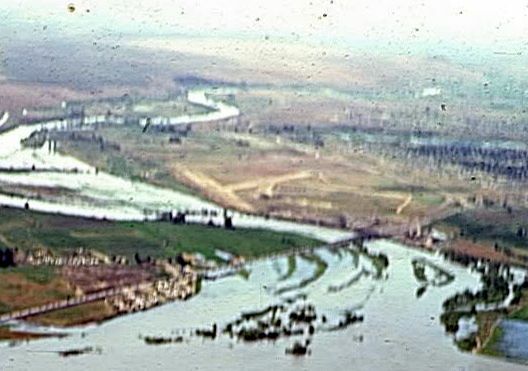 According to Vistafield.org, “In 1942 the Kennewick Irrigation District (KID) acquired land in the area of what is now Vista Field. In the same year the KID transferred some of the land to the City of Kennewick for a municipal airport. According to its FAA Airport/Facility Directory data, Vista Field was activated in September 1944. The earliest depiction which has been located of Vista Field was on the November 1944 Spokane Sectional Chart (courtesy of Ron Plante). It depicted “Vista (Navy)” as an auxiliary airfield. 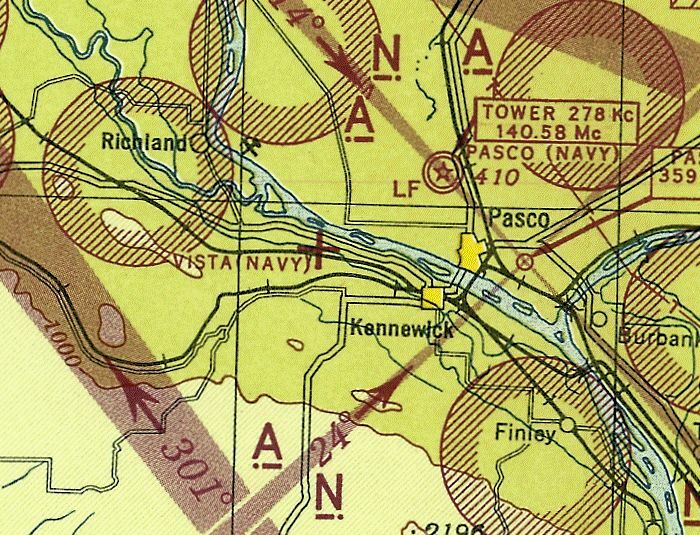 “Pasco Naval Air Station Auxiliary (Vista Outlying Field)”, as depicted in the 1945 AAF Airfield Directory (courtesy of Scott Murdock). as having 3 asphalt runways, with the longest being the 3,500' northeast/southwest strip. The field was said to be owned by the U.S. Government, and operated by the Navy. 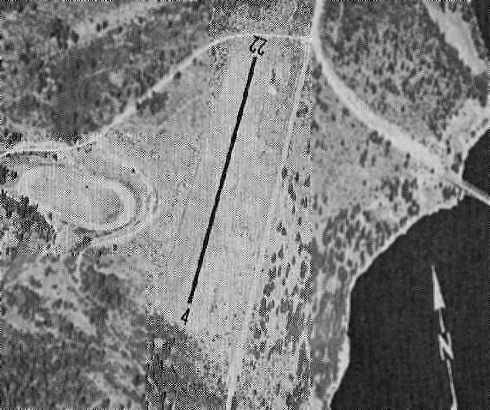 The earliest photo which has been located of Vista Field was on a 6/8/48 USGS aerial photo. It depicted Vista Field as having 3 paved runways. and an arch-roof hangar sat on the northeast side. perhaps aircraft carrier runway markings. The earliest topo map depiction which has been located of Vista Field was on the 1966 USGS topo map. It depicted Vista Field as having 2 paved perpendicular runways, with a ramp on the east side. was on the February 1973 Seattle Sectional Chart (courtesy of John Voss). It depicted Vista Field as having 2 paved runways, with the longest being 3,500'. According to Vistafield.org, “In the early 1970s the city wanted to close the airport. Airport users convinced the city to hold an advisory vote on the issue. City voters overwhelmingly voted to keep the airport. Since that time the city created the Kennewick Public Facilities District (KPFD) to build & operate a convention center near Vista Field. An undated aerial view looking north at Vista Field from the 1990 WA Pilot's Guide (courtesy of Scott Kimball). It described Vista as having a 3,500 asphaltic concrete Runway 2/20, and a Runway 11/29. The 1992 USGS topo map still depicted Vista Field as having 2 paved perpendicular runways. but it appears only Runway 2/20 was still in use. A total of 7 single-engine aircraft were visible on the west ramp. and 1 new commissioner & the retention of an incumbent commissioner on the Port Commission. These new office holders all stated their support for maintaining the airport. This has changed the political landscape with regard to the Vista Field Airport. Only 4 single-engine aircraft were visible in a 7/4/13 aerial view looking northeast. A 9/3/13 photo of the Vista Airport fuel pumps & terminal building. A 9/3/13 photo of a Diamond DA-40 & Cessns 172 at Vista Airport. Dorian Jepsen reported in 2013 of Vista Field, “I did one of my first solos there. It was a great place for pilots to land because it was within walking distance of a mall & restaurants. Basically close enough to town that you didn't need a courtesy car after landing. Unfortunately the end came for this nice little general aviation field in 2013. 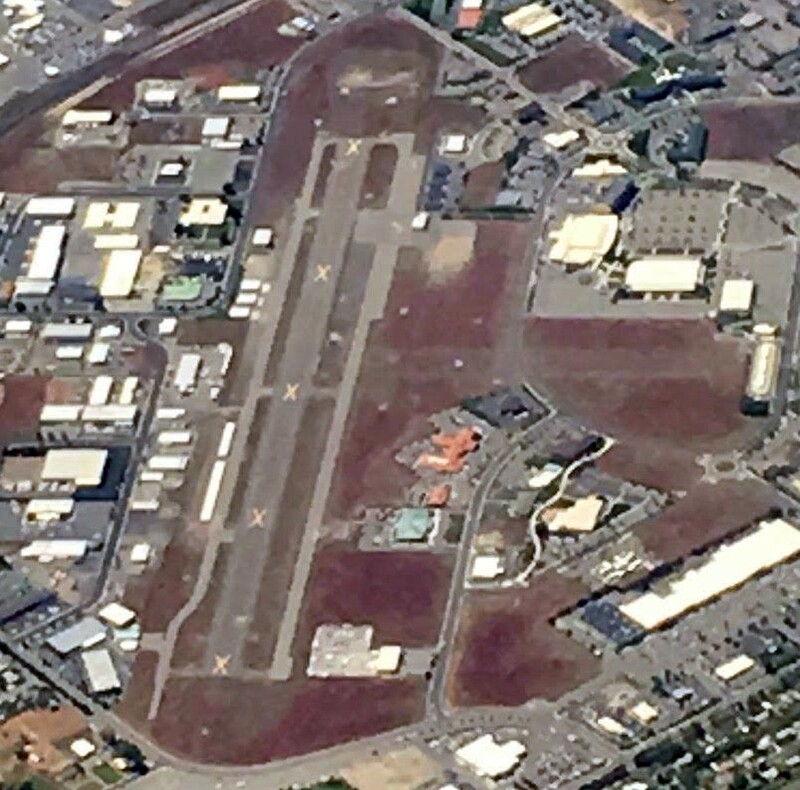 A sad 1/3/14 aerial view by Scott Kimball looking northeast at Vista Airport, with the closed-runway “X” symbols still being painted on the runway. A 5/15/17 aerial view by David Ulane looking south at the closed but still-intact Vista Field. David observed, “It doesn’t look like much has gone on there since it closed." Vista Field is located east of the intersection of North Young Street & West Grandridge Boulevard. Thanks to Dorain Jepsen for pointing out this airfield. Northport Airport, as depicted in the October 1954 Kootenai Sectional Chart (courtesy of Chris Kennedy). 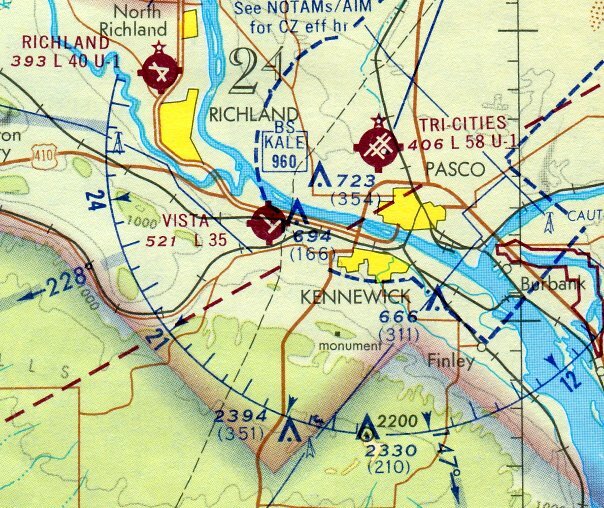 No airfield was yet depicted at this site on the March 1950 Kootenai Sectional Chart. recommended the site for development of a Class I airport. The preliminary estimated cost was $14,424, including 124 acres of land for $1,000. 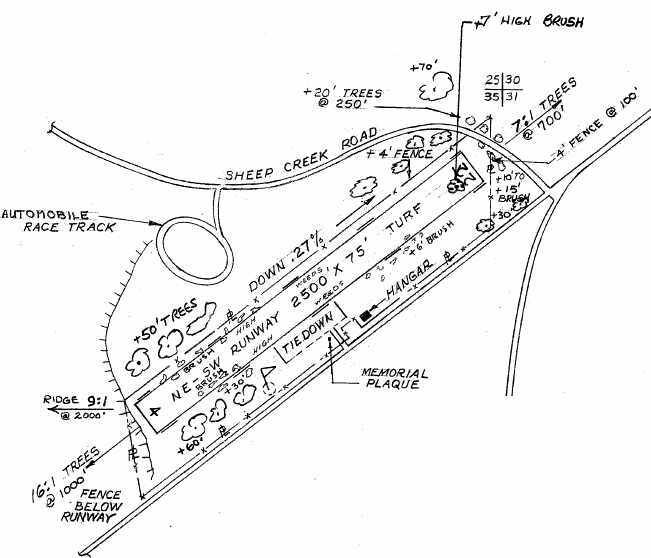 The airport, with a 2,500' x 300’ graded strip was constructed in 1950.
was on the October 1954 Kootenai Sectional Chart (courtesy of Chris Kennedy). 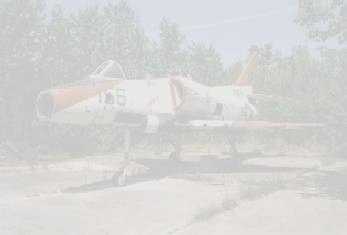 It depicted Northport Airport as having a 2,500' unpaved runway. as that is how it was listed in the 1963 WA Airport Directory (courtesy of Ron Dupas). The directory depicted Lowry as having a single 2,500' soil northeast/southwest runway. but there were no buildings depicted. 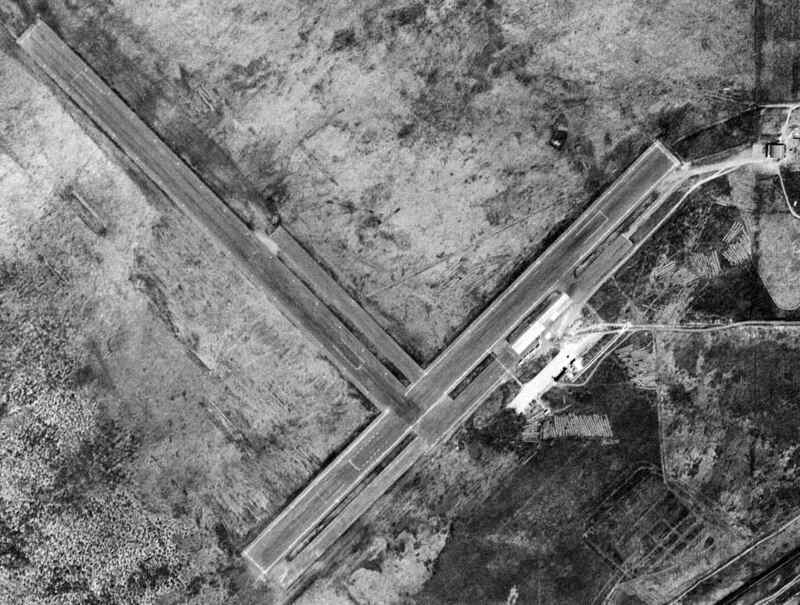 The earliest photo which has been located of James A. Lowry Municipal Airport was an 8/18/65 USGS aerial view. It depicted Lowry as having a single northeast/southwest unpaved runway. There were no buildings or aircraft visible on the field. from the 1971 WA State Airport Directory (courtesy of Chris Kennedy). 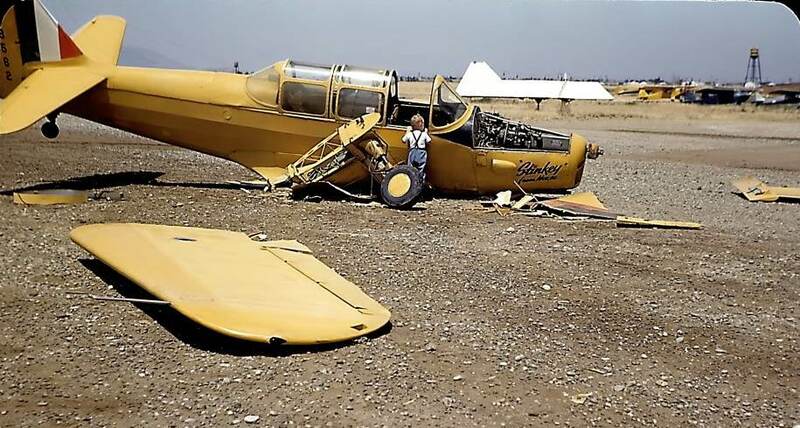 The directory described James A. Lowry Municipal Airport as having a single 2,500' soil Runway 4/22. The airport offered no services, and the manager was listed as Robert Weilep. which depicted Lowry Airport as having a 2,500' unpaved runway. but as a private airport (which appears to be a contradiction for a "Municipal" Airport - ?). with a tiedown area & a single hangar on the southeast side. and the Manager was listed as R. Norberg. The field was said to have only 1 resident aircraft. 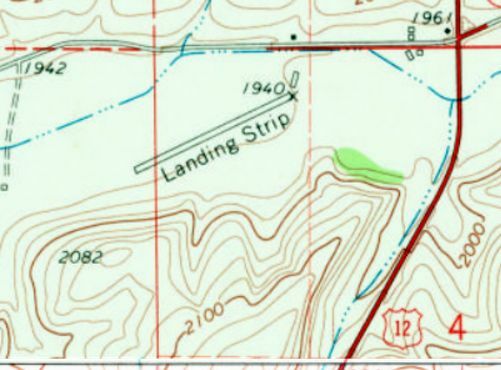 The 1982 USGS topo map still depicted the "Lowry Landing Strip". Lowry Municipal Airport was no longer depicted at all on the 1998 World Aeronautical Chart. Lowry Municipal's former runway remained intact. There did not appear to be any buildings or other aviation facilities at the airfield. I am always on the lookout for abandoned strips that can be re-opened. and hope to make a pitch to the State and the town later this year to open the airport again. and the city, until I came along, has no idea where to start the process. that used to be airstrips of some kind and have been closed over the years. I will be surveying the sites as I get time and investigate the feasibility of re-opening them as State Airports." directly across the Columbia River from the town of Northport. Asotin County Airport, as depicted on the November 1944 Spokane Sectional Chart (courtesy of Ron Plante). 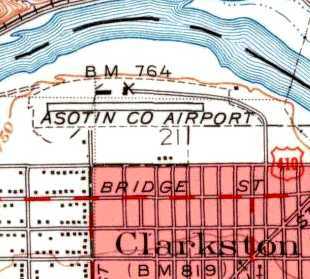 This small airport “was built in 1938 by Asotin County & the City of Clarkston”, according to Clarkston resident Steve Smith. my dad would take me there when he went to the dump (the dump was right next to the airport). The only operator was Bert Zimmerly. Burt's operation was called Zimmerly Air Transport. 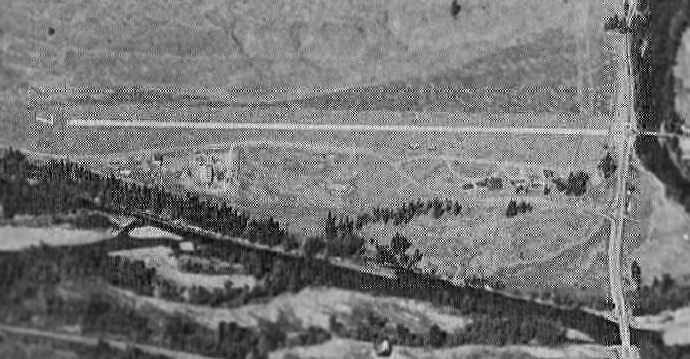 The earliest depiction which has been located of Asotin County Airport was a 1943 aerial photo. It depicted Asotin County Airport as having an unpaved east/west runway, with 2 hangars on the north side. 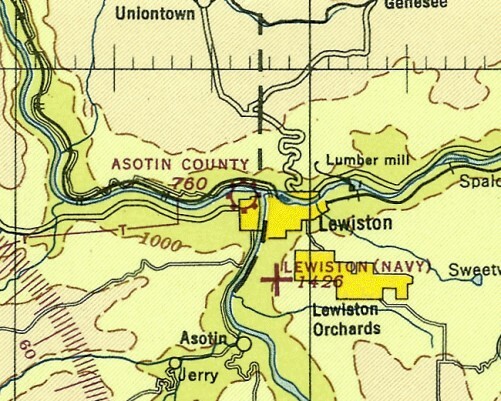 The Asotin County Airport was not listed in the April 1944 US Army/Navy Directory of Airfields (courtesy of Ken Mercer). which depicted Asotin County as a commercial or municipal airport. with a few small buildings along the north side of the runway. was an undated aerial view looking north from the 1945 AAF Airfield Directory (courtesy of Scott Murdock). The directory described Asotin County Airport as a 70 acre rectangular property having a single 3,400' east/west gravel runway. The field was said to have a single 200' x 80' wood hangar, and a 2nd building was visible on the north side of the runway. The airport was said to be owned by Asotin County, and operated by private interests. “was killed after the war in an accident in bad weather between Spokane & Clarkston. 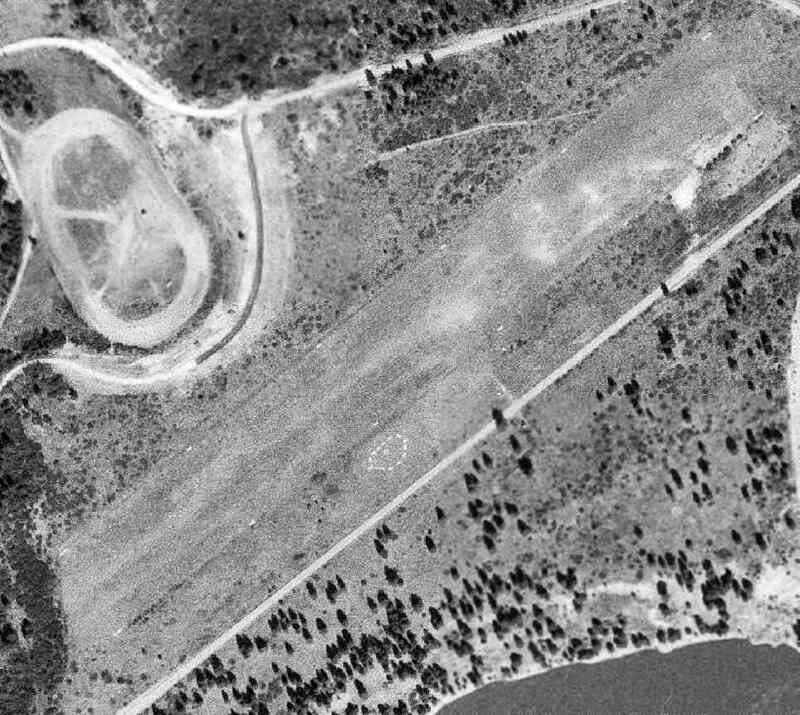 A 1955 aerial photo depicted 3 planes parked outside the hangars at Asotin County Airport. Dennis Johnson recalled, “Asotin County... that was the place I first learned to fly. I remember several hangars (this would have been in 1959). There was a complete Ford Tri-motor kept alongside one of the hangars. but the small control tower survived. A 1961 aerial photo depicted 5 planes parked outside the hangars at Asotin County Airport. 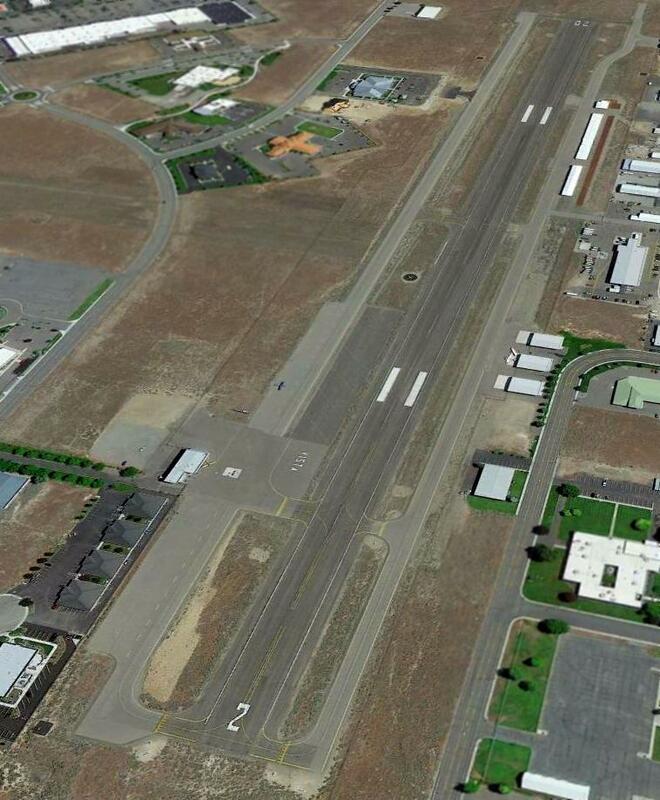 depicted Asotin County Airport as having a single 3,600' gravel east/west runway. A hangar, administration office, and shop were depicted along the north side of the runway. 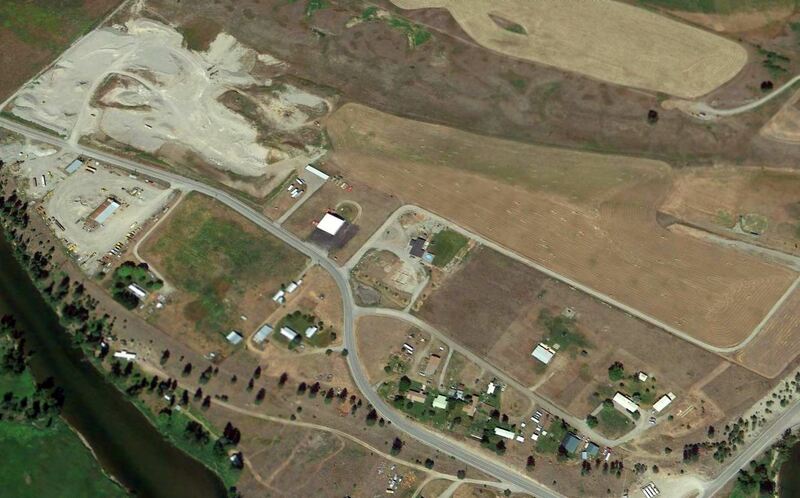 A 1970 aerial photo showed Asotin County Airport remained intact, but there were no planes visible parked outside. 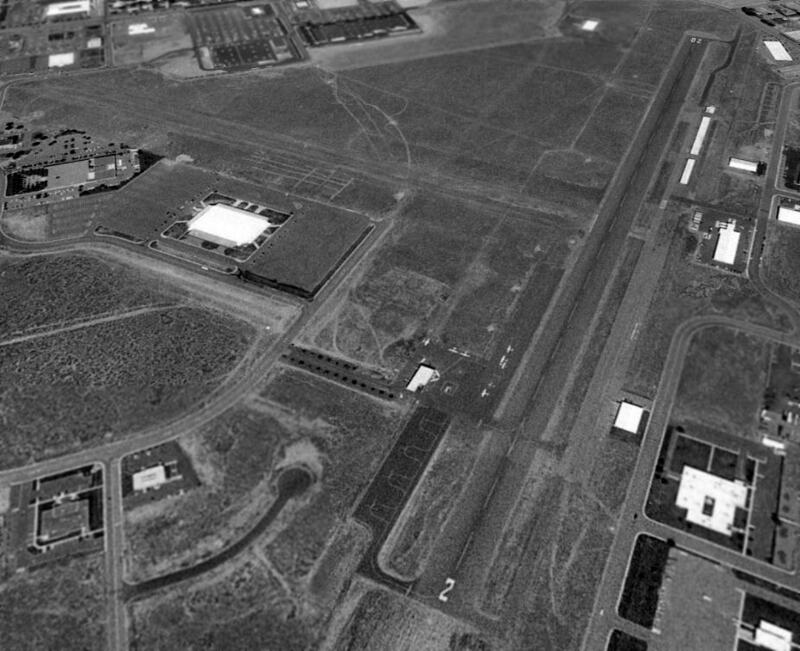 An undated aerial view looking north at the Asotin County Airport, from the 1971 WA State Airport Directory (courtesy of Chris Kennedy). and several buildings (hangars?) were depicted on the north & south sides of the runway. The manager was listed as Bill Behrens. with a parallel taxiway along the north side. Two buildings were depicted along the north side of the taxiway. According to Steve Smith, “The airport closed in the early 1970s. for many years during the 1950s & 1960s. for slack water navigation to the Pacific Ocean for barges that would haul grain & logs overseas. Asotin County & the city of Clarkston thought they should be in on this action so guess which site they chose? 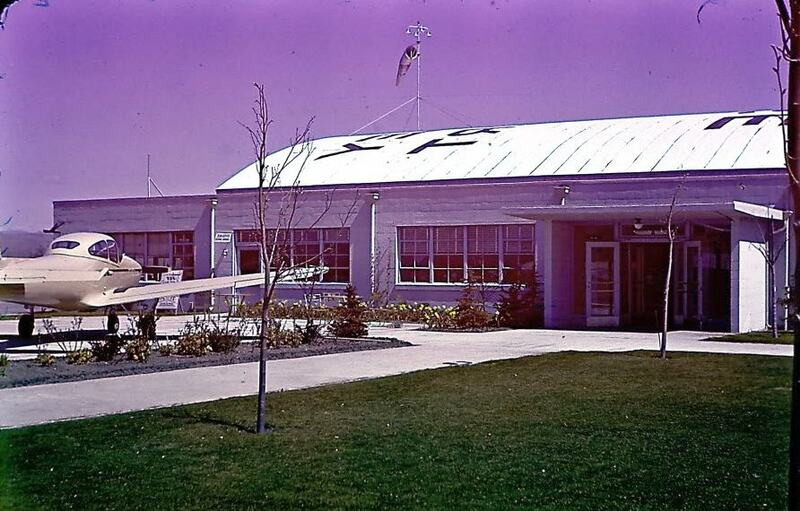 as it was no longer listed in the 1976 AOPA Airport Directory (according to Chris Kennedy). 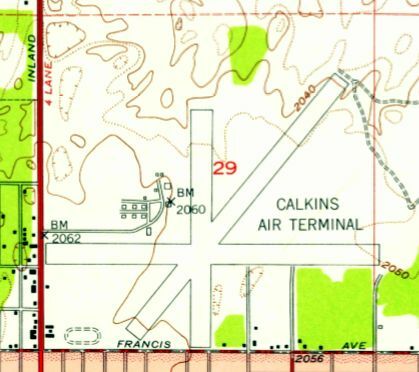 The 1981 USGS topo map still depicted the former runway, but labeled it simply "Airfield". According to Steve Smith, “The runway was 3,600' long by 100' wide, gravel, and at one point was lighted. 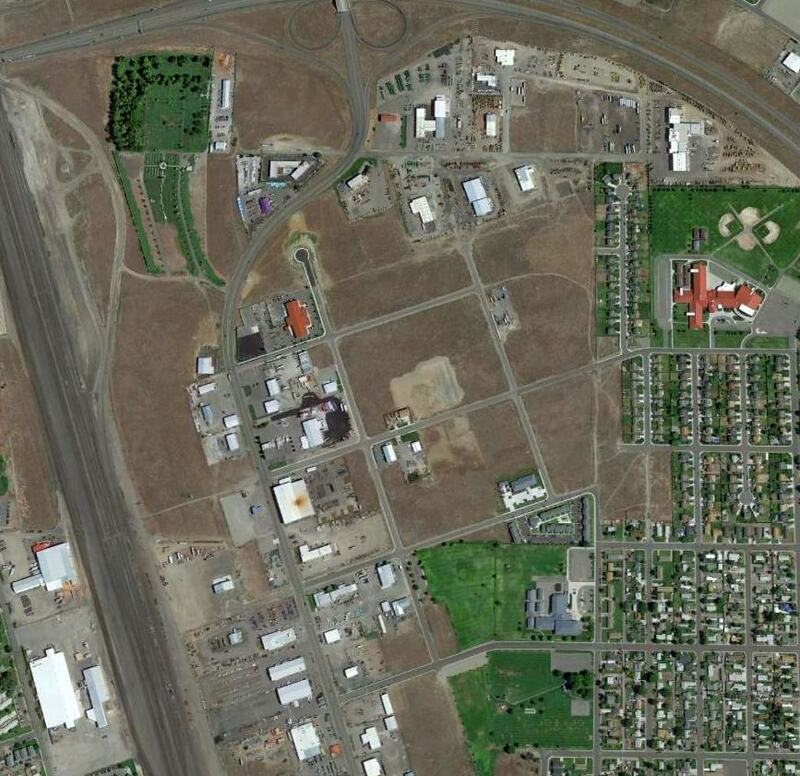 A 1998 USGS aerial photo showed several buildings & streets had been built over Asotin County Airport's former runway. But the 2 circa 1938-43 hangars remained standing on the north side. as they are occupied by an antique store. Steve Smith reported in 2007, “The big hangar was sold to Poe Aspalt & is still there today. then was bought by the Day family of Clarlston & they operate an Antque Mall there. I was home last weekend & went there. A circa 2010-2018 photo (courtesy of Lee Corbin) of the former Asotin County Airport hangar, reused by a business is known as “The Hangar Mall”. Asotin County Airport is located at the intersection of Port Drive & 13th Street. 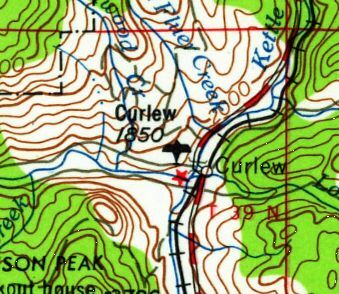 Curlew Airport, depicted on the 1958 USGS topo map. This general aviation airport was located only 6 miles south of the Canadian border. as it was not depicted on the 1948 Kootenai Sectional Chart (according to Chris Kennedy) or the 1951 USGS topo map. The earliest depiction of the field which has been located was on the 1958 USGS topo map. along with 2 hangars on the southeast side of the field. A "huge rock" was also depicted just northwest of the runway. 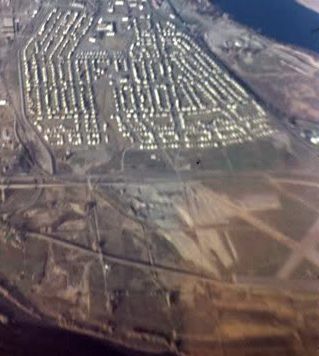 An aerial view looking north at Curlew Airport, from the 1971 WA State Airport Directory (courtesy of Chris Kennedy). and said that limited services were available, including fuel. The manager was listed as Carl Lindsey. The 1988 USGS topo map depicted Curlew as a single unpaved east/west runway, labeled simply as “Landing Strip”. depicted the field as having a single 2,700' paved Runway 7/25. Five small buildings were depicted along the south side of the runway. it was apparently in a state of decline, as it was listed as unattended, and to be used at "own risk". A 1995 USGS aerial view looking northwest showed one T-hangar was still standing on the south side of Curlew's runway. as it was not depicted at all on the 1998 World Aeronautical Chart. 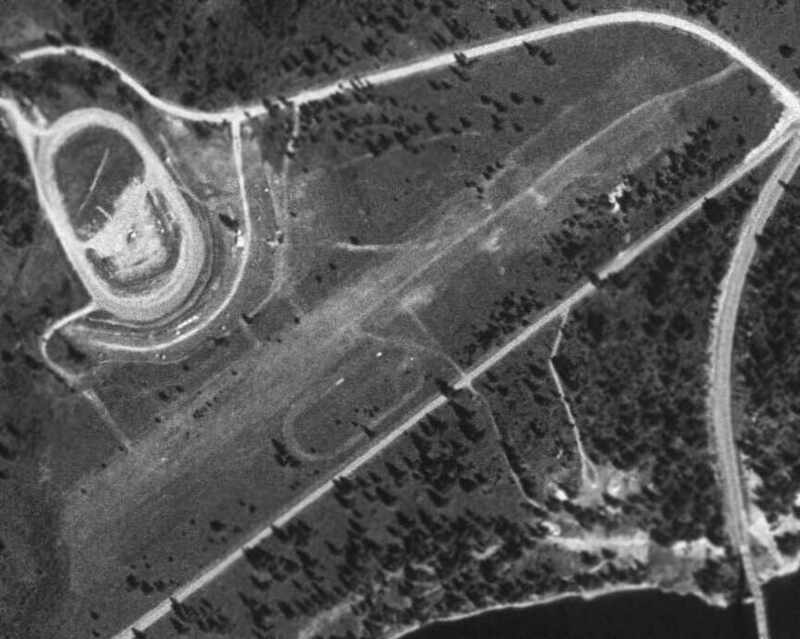 A 1998 aerial view showed Curlew's runway & its T-hangar remained intact. and the T-hangar had been removed at some point between 1998-2003. 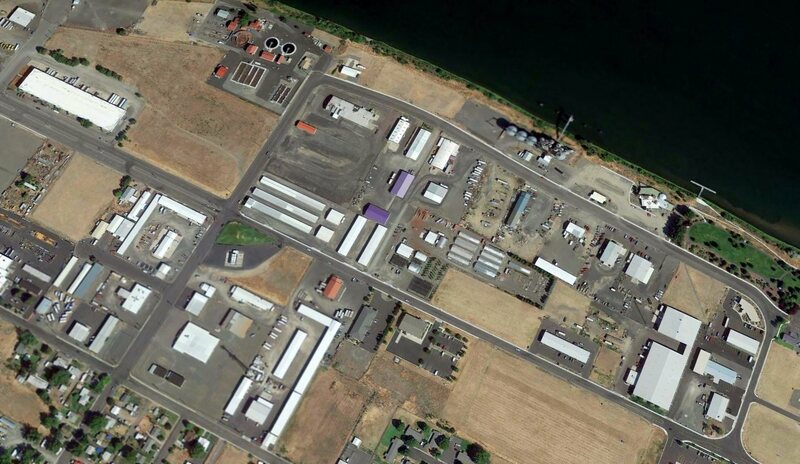 A 2013 aerial view looking northwest showed no trace recognizable of Curlew Airport. Curlew Airport is located northeast of the intersection of Customs Road & Curlew Airport Road, appropriately enough. 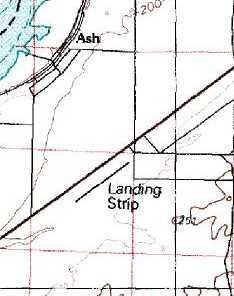 Ash Airport was depicted simply as “Landing Strip” on the 1976 USGS topo map. The name & history of this small airfield is unknown. 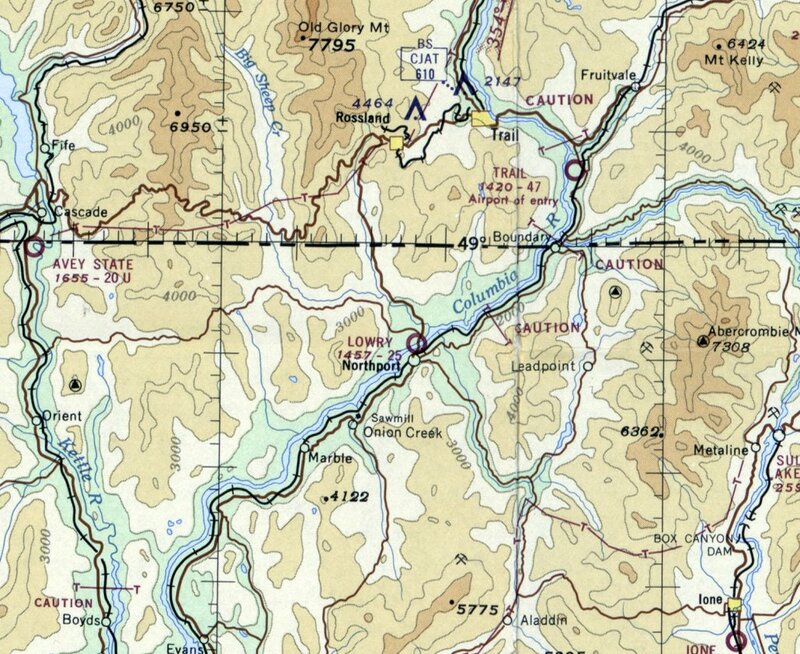 nor on the 1964 USGS topo map. which depicted a single northeast/southwest runway, labeled simply as "Landing Strip". 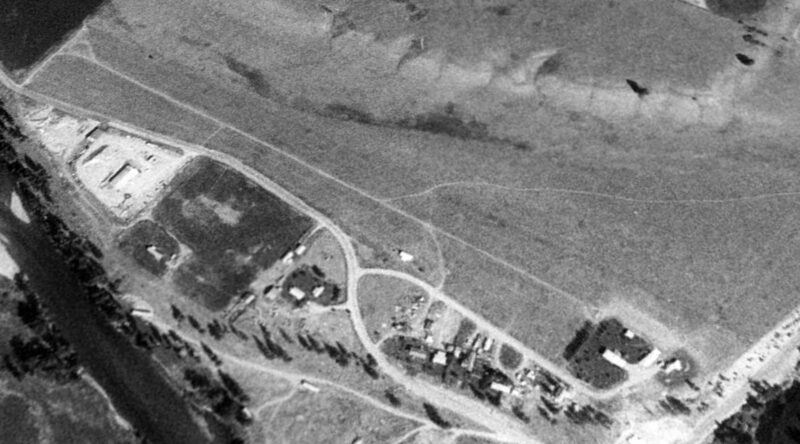 The earliest photo which has been located of the Ash Airport was a 7/1/96 USGS aerial view looking southwest. and a small paved ramp with several small buildings at the northeast end of the runway. Ash Airport was not depicted at all (even as an abandoned airfield) on the 1998 World Aeronautical Chart. There was no current airfield (public or private) listed at the location in the 2000 Airport Facility Directory. "Ash Airport is an interesting one; I have never seen an aircraft there. and was put down there when someone asked for a paved landing strip at the same time the excess occurred. I can't verify that, but as I said I've never seen an aircraft parked there. I heard indirectly that certain charter operators drop off passengers there. It certainly isn't an active airport at this point." An 8/24/11 aerial view looking southwest showed the Ash runway to remain completely intact. Ash Airport is located south of Route 124, 13 miles east of Pasco, WA.